Naga Chaitanya (Telugu: నాగ చైతన్య) is an Indian film actor who has appeared in Telugu films. He made his debut in the 2009 college film, Josh His second film, Gautham Menon's Ye Maaya Chesave became a commercial as well as critical success, with his portrayal of a love-torn film director winning him critical acclaim. His third film, 100 % Love released in 2011. 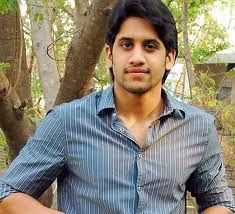 Naga Chaitanya was born on 23 November 1986 to actor Akkineni Nagarjuna and his first wife, Lakshmi. Naga Chaitanya's grandfather, Akkineni Nageswara Rao is one of the stalwarts of Telugu cinema. His maternal grandfather, D. Ramanaidu, is a famous producer in the film industry whilst his maternal uncle, Venkatesh is also one of Tollywood's biggest stars. Naga Chaitanya's cousins, Sumanth, Sushanth and Rana, are also film actors. Naga Chaitanya was born in Hyderabad, but moved to Chennai with his mother after his parents split. He received schooling at the PSBB School in Chennai, during which he often visited his father in Hyderabad. He played the guitar and drums occasionally for the PSBB school band. He was not originally interested in acting; he wanted to race cars and is still very good at it. [peacock term] However, his father convinced him otherwise and talked him into acting to keep the legacy going. He was then sent to an acting school in Mumbai, and subsequently to Hollywood Studios in California (USA) to learn dance and fights before he made his debut. Following in his family's footsteps, Naga Chaitanya's debut was widely anticipated. After several rumours regarding his debut, during the audio launch of his father's King, Chaitanya was introduced to the film world where his debut film was launched. Josh, directed by newcomer Vasu Varma and produced by Dil Raju, featured him alongside fellow debutant Karthika Nair, daughter of Radha, with his role drawing comparison with his father's character from Shiva. However upon release, the film fared averagely at the box office and received negative reviews from film critics, although Naga Chaitanya's performance secured him the Filmfare Best Male Debut Award for South Indian films. Prior to the release of his first film, he signed his second film with Indira Productions, which was to be directed by Gautham Menon and featured music by A. R. Rahman. Ye Maaya Chesave released in February 2010 to unanimous positive reviews with the film being dubbed as a "classic" by reviewers, with comparisons drawn to his father's romantic film, Mani Ratnam's Geethanjali. Critics also praised his on-screen chemistry with debutant actress Samantha, as the film went on to become a commercial success at the box-office. This was the Telugu version of the Tamil film, Vinnaithaandi Varuvaaya. He also made a cameo appearance in the Tamil version.